Allowing both the creation (from Image file formats, Image Scanners/Web CAMS and text files etc) and manipulation of Adobe compatible PDF files, PDF-Tools is an ideal tool to compliment your existing PDF creation application or as a 'stand alone' tool in it's own right! And PDF-Tools requires no additional 'plug-ins' or applications such as Adobe Acrobat or Distiller. Also now includes the new PDF-XChange Viewer PRO with a visual means to markup and modify your PDF files! 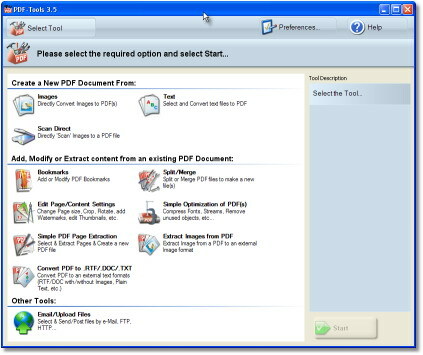 - Extract Images and Text from a PDF file to other formats. - Merge (overlay) PDF pages as stationary/forms onto text or another PDF pages - in background or foreground mode. - Optimise font embedding in existing PDF files. - Add text or Image based Watermarks to pages or entire files.